Whilst we're now only expecting 50mm on Friday and 15mm on Saturday, strong to near gale force winds will start on Friday and powerful surf conditions expected on Saturday and Sunday. After today's relatively 'small' storms passed through, the rain has arrived with a spectacular lightning show. Prolonged thunderstorm activity tonight and heavy rainfall is expected with the bureau is forecasting ‘thunderstorm clusters’ - which have the potential to regenerate on themselves as they move slowly across the region. 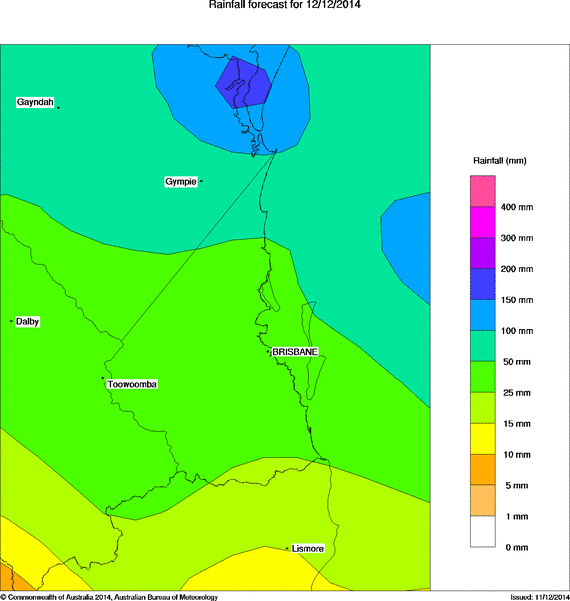 The more intense falls are now expected to affect areas north of the Sunshine Coast all the way to Rockhampton, however the Gold Coast could still see some decent and heavy falls. Starting on Friday, winds will be south to southeasterly between 20-40 km/h and peaking at 30-45 km/h on Saturday and back to 25-40 km/h on Sunday. Deceptively powerful surf conditions are expected to be hazardous for coastal activities such as rock fishing and swimming. Friday: Cloudy. Very high (95%) chance of showers, most likely in the morning. The chance of a thunderstorm in the morning. Winds south to southeasterly 25 to 40 km/h. Saturday: Cloudy. High (70%) chance of showers. Winds south to southeasterly 30 to 45 km/h. Deceptively powerful surf conditions are expected to be hazardous for coastal activities such as rock fishing and swimming. Sunday: Cloudy. Medium (50%) chance of showers, most likely in the morning. The chance of a thunderstorm in the afternoon and evening. Winds southerly 25 to 40 km/h. Deceptively powerful surf conditions in the early morning are expected to be hazardous for coastal activities such as rock fishing and swimming.